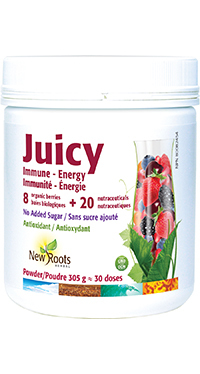 Juicy Immune ‑ Energy is a nutritional powerhouse that delivers a broad spectrum of compounds from a proprietary blend of nine berries and fruits formulated with standardized extracts and specific nutraceuticals, at a mere 14 calories per serving. The robust antioxidant action of Juicy Immune ‑ Energy represents the backbone of the many benefits to be reaped within every serving. Starting your day with a single portion of Juicy Immune ‑ Energy will lay the foundation for great health and help fill the nutritional gaps of even the most balanced diets. Adults: Mix 2 heaping teaspoons (about 10 g) with at least 8 oz.† (235 ml) of water or other fluids once daily, or as directed by your health-care practitioner. †Adjust amount of water to taste. Other ingredient: Stevia (Stevia rebaudiana) leaf extract.